The word—or rather, the identity of—“aurist” has an incomplete history. Even right now, as I typed the word, Microsoft Word automatically corrected it to “aorist,” as if questioning my word choice. A quick dictionary search turns up a definition of “an ear specialist” or even “former name for audiologist.” The former is true. The latter false. An audiologist studies hearing (or lack of) and measures degree of hearing losses, and the tem did not emerge until the late 1940s. An otologist, however—or the more modern otolaryngologists, or Ear/Nose/Throat doctors—studies the normal and pathological anatomy and physiology of the ear, as well as diseases, diagnosis, and treatment of various defects in the ear. “Aurist” is more fitting as an ancestor of “otology,” but the transformation of usage and identity formation was not an easy one. In my dissertation on nineteenth century British aural surgery, one of the major themes I address is the making of a speciality: how did practitioners of ear diseases, who chose to specialize and claim legitimacy for their field, identify themselves as specialists? The ways in which “aurist” or “aural surgeon” suggests the very ambiguous characterization of the word, even by those who asserted themselves as ear specialists. Looking through newspapers, correspondences, and publications, it’s clear that “aurist” was a panoramic term used to describe all practitioners who provided treatments for aural diseases, especially during the first half of the nineteenth-century. The earliest reference to “aurist” I found dates to a practitioner’s newspaper advert in 1775 and there’s a remarkable jump in the word’s usage starting in the nineteenth-century. At the same time, “aurist” was used to refer to a distinctive surgical identity, the specialist practitioner who also called himself an “aural surgeon,” whose knowledge of physiology and diseases of the ear enabled him to develop newer techniques for diagnosis and treatment. These were the practitioners who crafted their surgical authority by publishing widely on the anatomy, physiology, and diseases of the ear. They also called themselves “surgeon-aurists.” To use the word “surgeon” as part of a self-imposed identity was clearly to construct (in)visible ties to the tripartite hierarchy of elite medicine in nineteenth century Britain, which was composed of physicians, surgeons and apothecaries aligned in degrees of authority, while at the same time, distinguishing the specialist. Yet, much to this historian’s confusion, these practitioners also used the word “aurist” and “aural surgeon” interchangeably, dismissing the notion that the former was strictly an idiom of abuse. And even more confusingly—all practitioners of aural surgery were at one time or another, or even in the entire duration of their career, denounced as quacks, from John Harrison Curtis the “nefarious” aurist who attended to the royal family, to Joseph Toynbee, the pathologist who was the first to be appointed as Aural Surgeon at St. Mary’s Hospital. The whole story is so complicated that even at nearly 300 pages, I’m still not finished writing this story of the aurists and on aural surgery. So when did “aurist” fade away? It’s hard to determine, but words don’t really drop out of fashion all of a sudden. William Wright published a journal called The Aurist in 1825, but this was short lived, with a print run of only 3 issues. 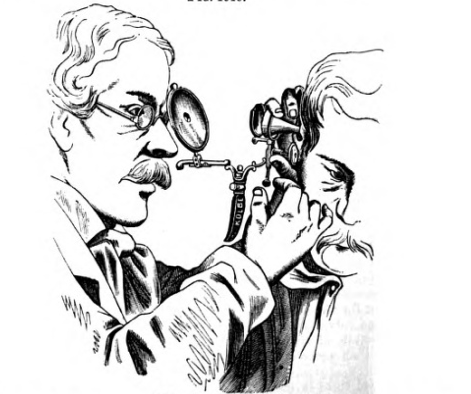 “Otology” started showing up in the second half of the nineteenth century. The German journal Archiv für Ohrenheilkunde (Archives of Otolarynology) was established in 1864 by Anton von Tröltsch (1829-1890), Hermann Schwartze (1837-1900) and Adam Politzer (1835-1920), with print runs in both German and English. The first British journal of otology, the Journal of Larynology and Otology founded in 1887 by Morel Mackenzie and Norris Wolfden—it was originally the Journal of Larynology and Rhinology and Otology was later added in 1892 after changes in editorship. Thanks to H.Stiles for the scan! We have every reason to be encouraged as to the standing of otology in America in the future and the cordial good feeling which exists among aurists in this country will do much to advance our branch of science. The aurists here seem always ready to acknowledge each others good work and to help each other in study and in experiment…” (quoted in Weir, p.184). Blake held the first Professorship at Harvard in 1870 and was also appointed Lecturer in Otology and Aural Surgeon to the Massachusetts Eye and Ear infirmary, clearing showing that “otologist” did not immediately replace “aurist” or “aural surgeon.” In England, Urban Pritchard (1856-1926) founded the department of aural surgery at King’s College Hospital in 1876 and was created Professor of Aural Surgery in 1886—the only chair of its kind in all of England. Pritchard was also the British representative on the committee of organization for the International Congress of Otology, which held its first meeting in 1876; he would become president of the society in 1899. 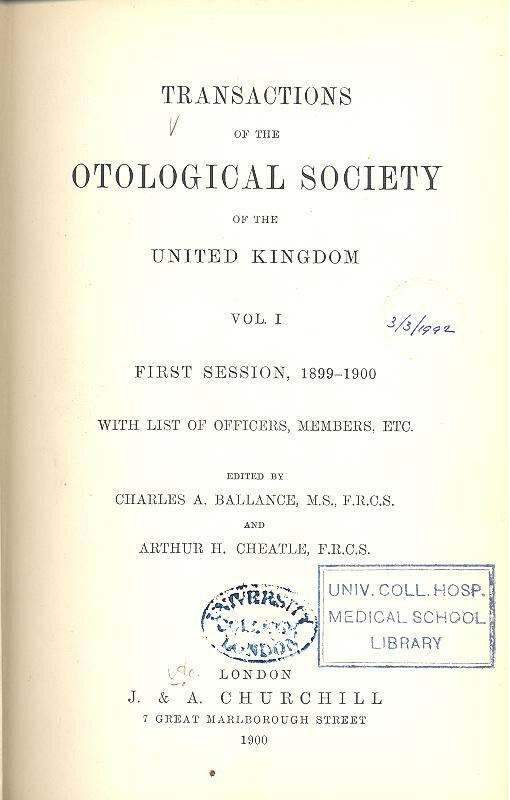 The Germans did not establish a society for otology until 1881, the British in 1900 with the Otological Section of the United Kingdom; seven years later the society would become the Section of Otology of Royal Society of Medicine. There’s still more work to be done, of course. This is but the beginning! For an overview of the history of otolaryngology, see: Neil Weir, Otolaryngology: An Illustrated History (London: Butterworths, 1990).